If you need a place to stay while visiting Knoxville this is it. It's a quiet, clean no frills campground. 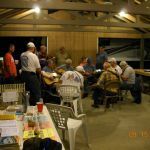 There were many guests there using the pavilion to play bluegrass music. Quite entertaining. No shade, no picnic tables, no fire rings. A great value where we felt safe and that is the reason for my high rating. Double A Knoxville Smokies baseball team stadium and BassPro is at exit 407. I wouldn't use exit 412 to access this park, road is very narrow. Use exit 407. We camped at Dumplin Valley RV in a Travel Trailer. Laid back and low stress camping! Campground and facilities were very nice and clean and there is plenty of room to let kids or dogs run around. Great for an overnight stay or a longer visit to the Smokies. We camped at Dumplin Valley RV in a Travel Trailer. Just stayed overnight with no unhook, great location just off Parkway for that purpose. Grassy, pull-through electrical site close to bathrooms was convenient. No trees for shade, but breeze was nice. Would stay here again on the way through. We camped at Dumplin Valley RV in a Travel Trailer. We were the only campers here tonight, other than what looks like one permanent. The owner came out and visited - super nice. Full hookups - easy to get in/out. Good AT&T phone and MIFi service. Picked up about 24 stations on antenna. Good clean water and good pressure. Quiet. Would like to come back during the bluegrass festival in September. We camped at Dumplin Valley RV in a Travel Trailer. This a nice quiet campground with lots of grass and no trees. The setting is beautiful. The host are just super. Very hospitable. Near and convenient to I-40. Close to Bass Pro Shop and McDonald's. I had no internet at my site. I will go back again. We camped at Dumplin Valley RV in a Travel Trailer. 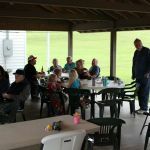 We spend time at Dumplin Valley RV Park each September and have stayed there at other times when we're passing through or staying in the area. Dumplin Valley is neither a destination campground nor a high amenity place to stay along the way. It is, however, a very well kept, clean, and comfortable place to stop for a night just off I-40 or to use as a base for visiting Sevierville, Pigeon Forge, Gatlinburg, the Great Smokey National Park, or Knoxville. Hosts are friendly people who do their utmost to make each stay a comfortable one for RVers. 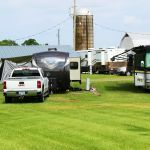 While amenities such as cable TV, park Wi-Fi, or a swimming pool are not directly available, the open grassy sites make finding a satellite TV signal easy, and there is strong 4G cell service for RVers who own their own connection devices. 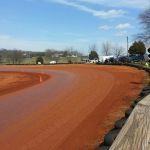 Knoxville is close enough to make over the air TV easily available. Sites are grassy and level, access is easy, and the park is never filled except during the September bluegrass festival. Dumplin Valley is a delightful place to stay. We camped at Dumplin Valley RV in a Travel Trailer. My husband and myself have stayed here 3 years in a row during there legendary Bluegrass festival. The park is fairly quiet as it's not directly on a main highway, but it is so close to shopping and restaurants that you get the best of both worlds. Easy to navigate campground even for your larger RVs and pull behinds. 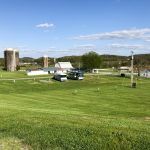 It is a lovely farm turned campground with the iconic silos and barn / gathering hall giving Dumplin Valley a rustic charm. All in all a great place to camp and hosts are such super nice people. We camped at Dumplin Valley RV in a Travel Trailer. Dumplin Valley provides a quiet, country setting just off exit 407 of I-40 in East Tennessee. It is a simple quiet campground that provides few amenities and all the necessaries. The restrooms are spotless, the grass neatly mowed, and The hosts are friendly and helpful. It is an ideal spot for an RVer to stop for a night while heading across Tennessee or to visit the sites in Sevierville, Pigeon Forge, and Gatlinburg if you're not looking for a resort setting. While there is no cable TV, over the air TV from nearby Knoxville is excellent. We have stayed there three times during the Dumplin Valley Bluegrass Festival and for an additional week because we like it as a campground. We camped at Dumplin Valley RV in a Travel Trailer.